Well, it is Friday. 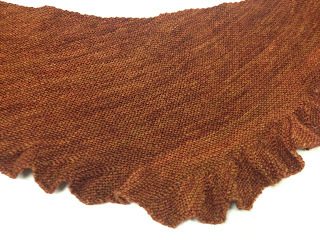 I have been knitting like crazy on the Milk Run Shawl for Camp Loopy Project Number 2. 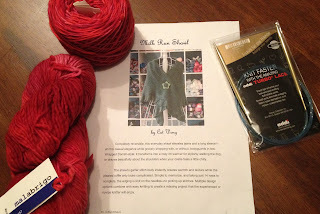 AND......I must be crazy because I also signed up for a test knit....yes, a test knit! 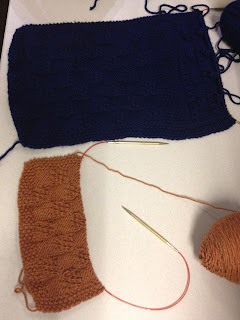 A test knit is where someone wrote out a pattern to knit, but they want people to test it before they make it available to the public......this is to make sure all the k's and p's are in the right place and that the pattern works. I am test knitting a baby lace blanket. 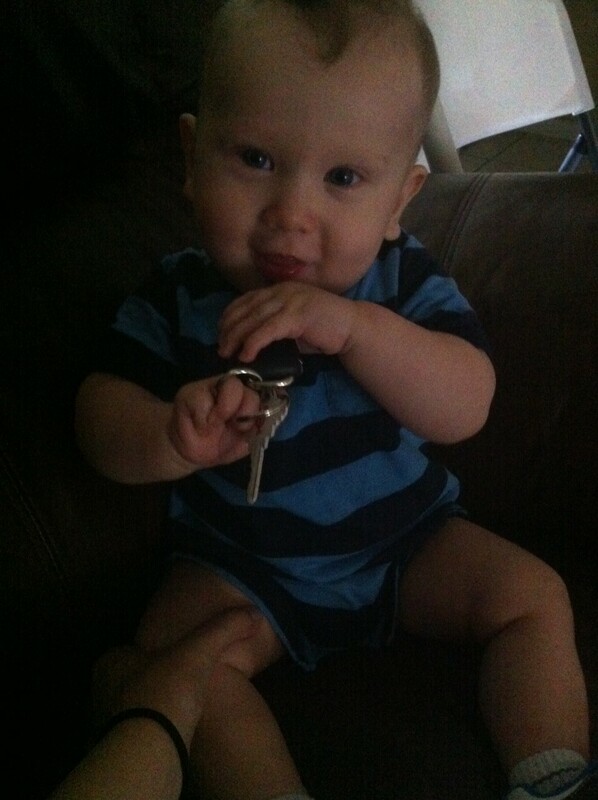 My daughter is going to the coast this weekend, so I get to baby sit my adorable grandson, Antonio. Here he is with his new Buzz Lightyear pajamas....he is 8 months. OK......great weekend of knitting. I recieved the Baby Bunny Yarn so I could work on my grand daughter's sweater. Here it is....almost done. Need to seam (yes, I hate seaming) and finish up the bow. I do not have a snap yet, so I will have to buy one and sew it in. I got a new tatoo on Saturday night. It is my second tatoo. No, I am not some big bad tatted up gal. Both of the tatoos are about the size of a quarter. The first one is a longhorn, the black ink bleed a little, but I still love it. 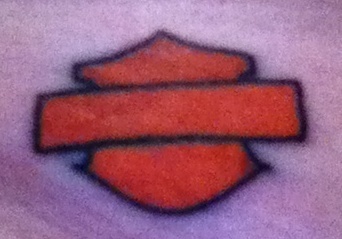 The one I got Saturday is a Harley Davidson emblem. No words, just colors. One day, I will get a couple balls of yarn with knitting needles, just not sure where I am going to put that. Then, my boyfriend bought a new truck! I cannot believe how expensive vehicles are these days.....Anyway, he let me drive it and it was a nice smooth ride....Yahoo!! Now.....to the exciting part of the week....Camp Loopy Project 2 STARTS TOMORROW!!!! Yipee!!! Are you ready??? So, I have an update on the big brouhaha in the knitting world yesterday. The Crochet Liberation chimed in with an awesome letter! Then, the USOC apologized. It is a weak apology, but a start. Since they realized it was weak, they updated the apology. Here are links to the Crochet Liberation Front Letter, and the apology on NPR and the updated apology on Team USA webpage. Let this 24 hour whirlwind be a reminder.....never mess with ladies that have pointy sticks! Hi! It is Thursday and I am very excited! 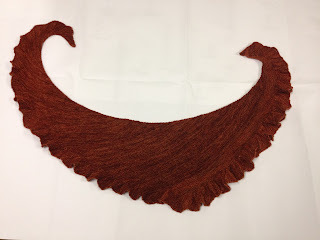 I finished my Lintilla shawl yesterday. I have a friend that has a blog and she posts her finished items on Friday's and calls it FO Friday...but I just could not wait to show you all! This is my Project One for Camp Loopy. I love this pattern so much, I am thinking of making another one! Now....what to work on while I wait for Camp Loopy Project Two to start? I have so many things OTN that I have several items to choose from. I decided to work on some squares for a blanket (from the Building Blocks book by Michelle Hunter). I am making 3 different afghan blankets, and I know it will take me a long time to make them all, but I thought doing one square at a time to build one panel at a time feels satisfying and not boring....here is a picture of two panels. The blue one has 1 1/2 quares done, and the persimmon one has barely 1/2 of the square done (the blue yarn is a little thicker than the persimmon, but they will be the same blanket pattern). 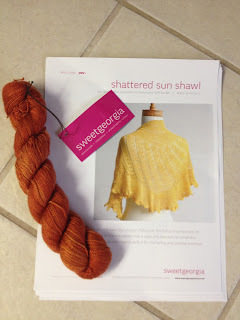 Oh, and as promised, here is the picture of the Sweet Georgia yarn I got with the Shattered Sun Shawl pattern, I have been telling myself I cannot start till I finish some other projects....so far it is working, but I am not sure for how long. On a much cuter note, my grandson had to go to the allergist yesterday. He has allergies, but they are not too bad. For now we are going to switch his formula to a soy based formula. Here is a picture of him at the doctor's office playing with a big catepillar until the lady walked in to stick him in the back (he is only 7 1/2 months). Lat but not least, here is a picture of Jaime and I at Coyote Ugly on 6th Street in Austin last weekend for the ROT Rally. 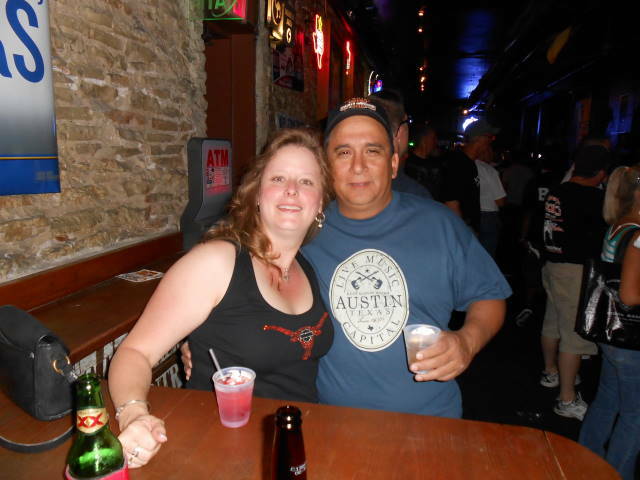 That is my new shirt from some friends, it combines a couple of my favorite things.....Longhorns and Harley (there is a Harley Emblem in the middle of the Longhorn)....Now, if I could just find a shirt with Longhorns, Harleys and Yarn!!! OK, so it is my first post on this blog. It is early June, and it is getting H O T in Texas. I have quite a few things going on in the knitting world. First I am going to Camp. Camp Loopy that is! 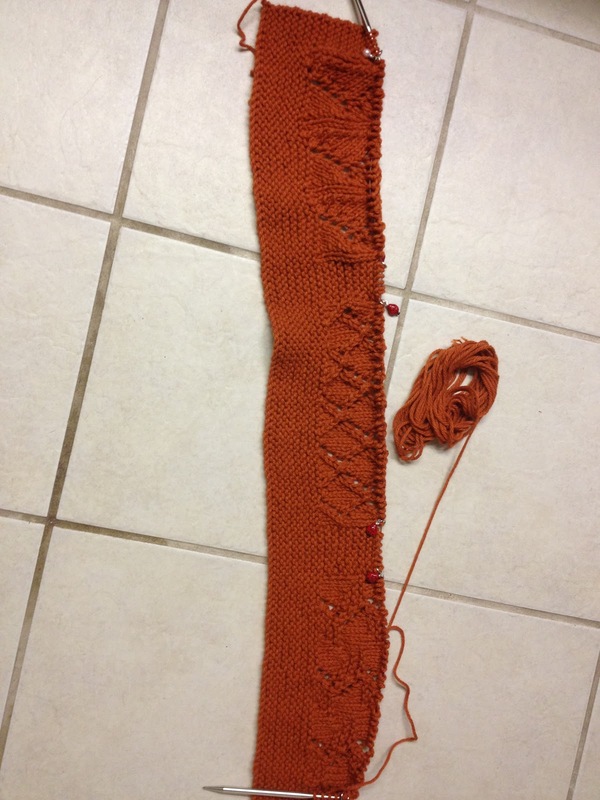 For Project One, I am making the Lintilla Pattern by Martina Behm. I am really enjoying knitting this.﻿ I am thinking of making a few of this designer's other patterns. Then, in early July there is a KAL with Michelle Hunter. I got the yarn and this picture is of the yarn on my bed sheet. I am planning on making this pillow (or multiple pillows) for my bed, so I got the Simply Sage to match....I think it matches ok, what do you think?